Ms. Bean-Raymond has been recognized, interviewed and published in leading horse publications as well as local newspapers such as the Equine Journal, SmartPak Equine, The Horsemenʼs Yankee Pedlar, The Emergency Journal, The Salem News, The Hamilton/Wenham Patch, and The Lawrence Eagle Tribune. Many of the articles are listed below. Read published book reviews for the “Illustrated Guide to Holistic Care for Horses” on the Holistic Horse Book Page. Denise Bean-Raymond - Featured in Equine Journal May 2016 - "Out of Joint; A Guide to Arthritis"
Denise Bean-Raymond, owner of Exclusive Equestrian Services LLC, is pleased to announce that she is currently being featured in the May 2016 edition of the Equine Journal. 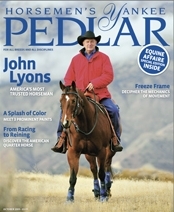 The article, "Out of Joint; A Guide to Arthritis," features her interview regarding Equine Arthritis. It is on page 52 of the Equine Journal. Be sure to pick up a hard copy or purchase on iTunes. Denise Bean-Raymond - Featured in the Equine Journal June 2013 - "Massage Pointers"
Denise Bean-Raymond, owner of Exclusive Equestrian Services, is pleased to announce that she is currently being featured in the June 2013 edition of the Equine Journal. Her article, featured in the "Bits & Pieces/Tips from Top Professionals Section," is titled, "Massage Pointers." The article is on page 38 in the print edition, and on page 40 in the online edition. The Georgetown Record October 2012 - "Holistic Horse Healer Works Miracles in Georgetown"
Denise Bean-Raymond is proud to announce that the "Georgetown Record" newspaper is currently featuring an article discussing her equine therapy practice - the article is titled, "Holistic Horse Healer Works Miracles in Georgetown," and is written by Sally Applegate. The article and accompanying photos can be found on the front page of the Georgetown Record newspaper (October 18, 2012 Edition), or viewed & read online - Hope you enjoy reading it & many blessings to you all. Denise Bean-Raymond was a featured guest, interviewed by Patricia Cleveland, on the equine radio program, "The Balanced Horse Project". Listen to the radio interview that aired on Sunday, June 9, 2012 on the Dreamvisions 7 Radio Network. The June 2012 edition of "The Equine Journal" features an article dedicated to complementary/alternative therapies for horses. Photos of Denise Bean-Raymond working on horses accompany this piece. Be sure to pick up a copy, and turn to page 78 to read the article titled, "Alternative Therapies at a Glance," written by Karen Elizabeth Baril. Denise Bean-Raymond is currently being featured in the Member Spotlight section of the July 2011 Women's Horse Industry Association newsletter. This organization is the largest business network in the world devoted to women working within the equine industry. Please visit the Women's Horse Industry Association web site, and sign up for their monthly e-mail newsletter to read the piece about Denise and her business. The newsletter signup is located on their HOME page (scroll down to the signup section in the right column). The Equine Journal June 2011 - "Alternative Therapies - Ways to Improve Your Horse's Health"
The June 2011 edition of "The Equine Journal" featured an article on alternative therapies for horses. Denise Bean-Raymond was interviewed for this piece, and shares her expertise on Equine Massage Therapy, and Equine Acupressure Therapy. The article is written by Pamela Mansfield. "If you’ve ever considered alternative therapies to help your horse heal from injuries or just feel more supple and comfortable, the choices are wide-ranging and worth a closer look. Chiropractic treatments, therapeutic massage, acupressure, and LED light therapy are among the treatments in regular use for both competition horses and non-competition horses, helping with lameness, stiffness, flexion, and even digestive issues..."
The 2009 December 16th issue of the Salem News featured an article in which Denise was interviewed about her business and her book. The article was titled "Holistic Horse," and was written by Bruno Matarazzo Jr. Denise shares her experiences that led her to become an equine therapist. The 2010 March/April issue of The Journal is currently featuring an article discussing Denise's passion for offering a holistic approach to helping horses. The article is titled ,"Horse Healer," and is written by Heather Darata. Denise's therapy and book are the topics explored in this piece. The 2009 November issue of the Horsemen's Yankee Pedlar is currently featuring an article which discusses equine alternative therapies. Denise is featured in this piece. The article is titled , "Working Together For A Healthy Horse." It can be found in the Stable Solutions Column, and is written by Sue Perry. Denise shares her knowledge with respect to equine massage therapy, as well as equine acupressure therapy. The Equine Journal - "Equine Career Opportunities/Insider Tips on How to Snag the Equine Career of Your Dreams"
Denise and other equine professionals were interviewed by the Equine Journal for this Equine Careers article. The on-line radio show called “Animal Talk Naturally” has featured Denise as a guest several times. The Power of Touch; Equine Massage and Acupressure. Denise Bean-Raymond is most honored to share with you that she will be attending the 2015 Horses Inside Out Training, Therapy & Performance Conference. This event is going to be held in Wawickshire, England. Denise will be amongst leading veterinarians, scientists, therapy researchers and Olympic trainers. She is greatly looking forward to this event! Denise is proud to announce that in her constant desire to further develop and expand her knowledge and skill, she will be completing her final year in Equine Nutrition School this year and will be offering nutritional counseling for your horses. She has been working very hard to complete these courses over the past several years under the guidance of Dr. Eleanor Kellon, DVM., and greatly looks forward to offering this service in 2015. Author, Denise Bean-Raymond has released an instructional DVD featuring equine massage techniques for your horse. The DVD features step-by-step instruction to assist you in helping your horse. This DVD remains true to Denise Bean-Raymond's form, in that it is clear, thorough and logical in its presentation...yet another fantastic resource to educate those that wish to enrich their horse's life. Denise Bean-Raymond is proud to announce that her book, "The Illustrated Guide to Holistic Care for Horses" has been included on the "Healing Touch for Animals" list of recommended reading. This organization educates and certifies those wishing to become practitioners of energy medicine for animals, addressing health issues, behavioral concerns and emotional stability. Denise is most grateful that her work has been embraced by this organization's curriculum. As a true testament to Denise's never ending quest for knowledge, she has recently completed the following courses in her pursuit for equine nutrition certification. She has successfully finished the National Research Council's Recommendations Course, as well as the Neurological and Muscular Disorders Course, both under the instruction of Dr. Eleanor Kellon. We wish to congratulate Denise on these achievements, and look forward to hearing of her next nutritional course completion. “The Illustrated Guide to Holistic Care for Horses” has received the outstanding rating of 5 out of 5 stars on www.goodreads.com. This site is the largest social network site for readers in the world. Denise is once again most grateful for this accolade. “The Illustrated Guide to Holistic Care for Horses” is currently listed in the "Top 100 Bestselling Books" in the Horse Care category on the global site Amazon. Denise wishes to thank all of those that have purchased her book throughout the world. “The Illustrated Guide to Holistic Care for Horses” is being used as a reference tool for the informative websites, www.soyouwanna.com and www.suite101.com. These sites post numerous articles on relevant topics for which there is demand. Marie Sberna, a writer for these sites, has referenced Denise's book for several of her articles, including those related to colic, as well as plants that are toxic to horses. The ongoing success of Ms. Bean-Raymondʼs book, titled, “The Illustrated Guide to Holistic Care for Horses” continues, as it has been adapted into the curriculum of the Global College of Natural Medicine as part of the Holistic Animal Nutrition Certification Program. Congratulations to Denise. She thanks all those who have purchased her book, and is grateful to share her knowledge to empower owners to help their own horses. “The Illustrated Guide to Holistic Care for Horses” is now available for purchase on this site. Click here to place your order. Denise Bean-Raymond is pleased to announce that she is currently completing her Equine Nutrition certification under the instruction of Dr. Eleanor Kellon of Equine Nutritional Solutions. She will be offering consultations in the near future. Equine Nutritionists educate horse owners on appropriate feeding, supplements, vitamins, herbs, and other dietary needs. Denise will be sharing her knowledge with respect to feeding performance horses, senior horses, pregnant mares, horses with disorders, and those in need of general nutritional assistance. Denise looks forward to offering this much needed service to you and your horse. Exclusive Equestrian Services is happy to share with you that we have a new, updated Facebook page. Events and happenings will be posted here. Please visit our page, follow us on FB and “Like” us. As always, thank you for your continued support!! Denise Bean-Raymond is available for clinics, demonstrations and lectures at your facility, event, expo or horse show. She is known for her clear communication skills, patient teaching abilities and absolute thoroughness. She offers these services locally, as well as nationally. Her clinics at Equine Affaire were standing room only. Advance booking is highly recommended for all clinic/lecture/demonstration requests. Denise has been featured in many publications. View the archives to read more published articles.